A Classic Knoxville Wedding featuring Jessica & Mitchell. We met Jessica and her entourage at The Pink Bride Show in January. She had a solid plan for her wedding day. One of the reasons she chose us was our diverse style. We do lots of types of weddings & have great range and she liked that. She explained her ceremony would be very private at the UT Botanical Gardens with a larger reception at The Sunsphere. I really like having two locations because it gives us time to shoot between events. They were also interested in trying “first look.” And I love when couples create a day that is what they want – not what everyone expects. Jessica & Mitchell were a great fit for us. A little break between the ceremony and the reception - Jessica & Mitchell had a classic Knoxville wedding. Early on wedding day . . .
Before we get too far along, let’s back up. Let’s look at the entire wedding day. They each got ready at family members houses. Family for both of them is very important – and the biggest reason they are a good fit for us. With my wife, Allyson - an amazing second shooter, we shot the dress together at Jessica’s sisters home. Then I left her to finish capturing the ladies getting ready while I headed to the grooms getting ready. 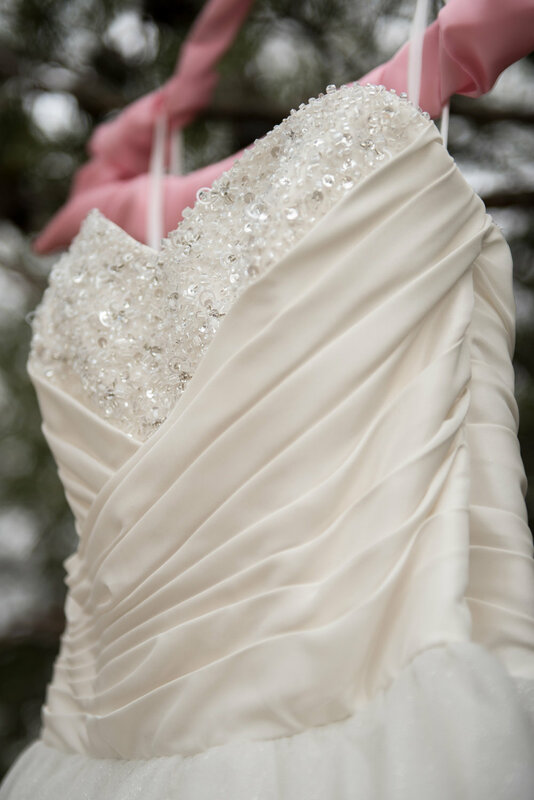 Detail of Jessica's dress - it was stunning! Love this shot - great light & great moment. I found the groomsmen, in typical fashion, not wanting to ever really get ready. They were shooting pool instead. Grooms often nervously spend time doing anything but getting ready. But I got them going by suggesting some fun photo ops. Mitchell’s father has a 70’s model Cadillac El Dorado that was his father’s. This is not just a cool car, but very sentimental too. I always incorporate the authentic moments of the day. We took this before "last game - for real." Like father, like son - with grandpa's Caddy to pull it all together. The Gazebo was draped for privacy & hiding the bride - nice work Colleen! Soon the bride arrived with her bridesmaids. We set the scene and they had wonderful few minutes together – intimate and powerful first look. Jessica a few minutes before "first look" - every little thing was perfect! This is why "first look" is important. This was their moment with tears of pure joy. The way the venue is set up, there’s not much way to hide the bride from the guests. But one of my strengths is diplomacy – letting others have my way. I told the guests we needed to come around the backside of the gazebo for a group photo. We had them out of the way so the bride could sneak into draped gazebo. Their backs are to the gazebo while Jessica & her entourage sneak in. A fun photo to keep them distracted a little bit longer. Once she was hidden inside the guests could then find their seats. Everyone was in place. Music. Now for the reveal - here comes the bride! She was perfect!!! Love this reveal - unique to her wishes and she owned that moment! The ceremony was private, personal and very much a wedding ceremony on their terms with only the immediate family and very close friends in attendance. Every little details was lovely with plenty of smiles all around. The altar at UT Botanical Gardens is always impressive. Mitchell nailed the dipped kiss!!! We then found a lovely little spot for the formal photos. The ceremony was in early March. The saucer magnolia in the background was giving us a little color. Next the newly weds jumped into their getaway car to head to World’s Fair Park for some fun photos with the group. Convertibles are perfect getaway cars! We had a blast with the entire bridal party at World's Fair Park. 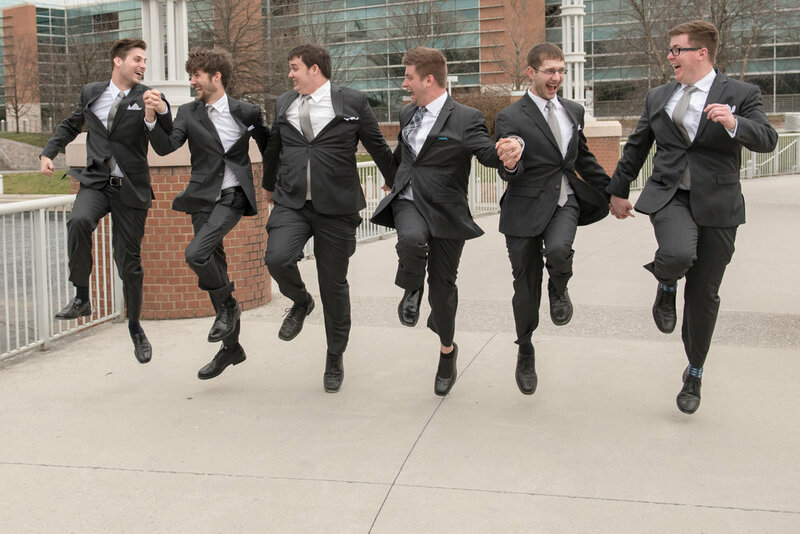 Not sure which is my favorite – the groomsmen skipping along or Jessica getting a handful of Mitchell’s backside. These men OWNED this shot! Mrs. Swain verifying the merchandise! After this little photo session, we headed up to the Sunsphere. Jessica & Mitchell were introduced as Mr. & Ms. Swain for the crowd. One of my favorite shots of the couple. Mr. Swain couldn't be happier! After the intro they moved right into their first dance. Love the love between them! They moved immediately into the father/daughter & mother/son dance with Mitchell’s father filling in for Jessica’s father who passed away. But he was honored and remembered throughout the day. With charm & class Mitchell's father stood in for Jessica's father. Earlier in the day, Jessica remembering & honoring her father. Her father was at the celebration too. The dances led to dining & mingling with guests. Jessica's and the dress looked amazing the whole day. Next up was cake cutting. Both the wedding cake and grooms cake were beautiful. They were kind to one another. No smashing of cake into each others' face. Gentle and sweet because this cake was really too good to smash. The traditions of bouquet toss and garter toss were super fun. Somebody is gonna get it! To work off the food and cake, the guests took to dancing. Jake James kept the guests dancing all night! During our first consult, Mitchell talked about having photos of the city of Knoxville below. This was important to him. The Sunsphere has tons of mirrors that produce glare and reflections. As darkness fell I began to notice the dream like quality of those reflections. So I captured a few of these. Mitchell, Jessica and the Knoxville beyond - looks like a dream. The night ended with a new trend – glow stick send off. Glow sticks & love!!! I want to thank all the vendors who helped make this day magical. Anderson Rentals for every little thing. 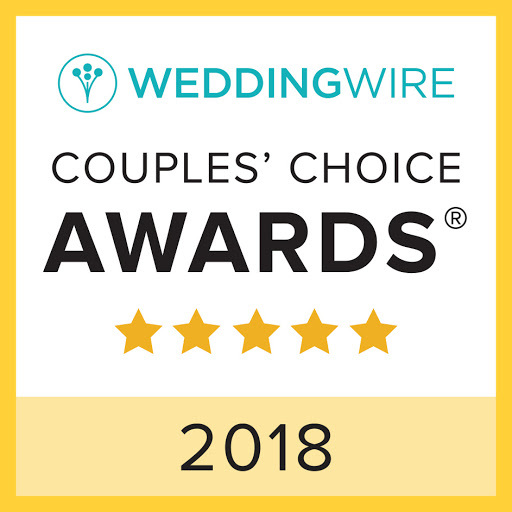 The Pink Bride - for connecting us! And finally, thanks to my wife, Allyson, for being the best! And a very special thanks to Jessica & Mitchell for choosing Mile Marker Images to capture their Classic Knoxville Wedding.